‘Red Riding Hood’ is one of those early 1930s cartoons that have to be seen to be believed. In this spoof of Red Riding Hood, the ill grandma is visited by a doctor. The doctor’s “jazz tonic’ makes grandma young and handsome, and the wolf starts to fancy her. He plays for her on the harmonium, while ‘grandma’ dances. However, when Red Riding Hood (a Minnie Mouse-copy, see also ‘Circus Capers‘ and ‘The Office Boy‘) enters, the wolf and grandma both flee in the wolf’s car to get married. Red Riding Hood, meanwhile, warns the wolf’s wife and kids, who hurry to the wedding chapel. They tear the wolf away, leaving grandma crying. There’s some nice animation on the wolf’s car, but otherwise the animation on this cartoon is wildly inconsistent. However, its story is so weird, it becomes enjoyable. The three pigs sell their straw and wooden houses to Bugs Bunny, because they’ve read in a book what’s going to happen. The wolf, who’s reading the same book, indeed blows both houses down, to much dismay of Bugs. Bugs revenges by dressing up like Red Riding Hood. This leads to hilarious sequences, including a perfectly executed light and staircase gag. In the end, Bugs helps the wolf blowing the pigs’ brick house down, by blowing it up. 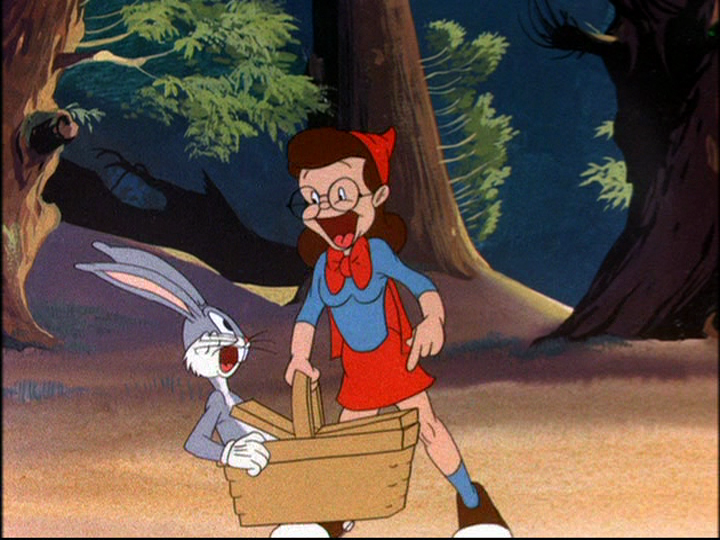 ‘The Windblown Hare’ is a nice example of a fairy tale mix-up cartoon, comparable to ‘The Big Bad Wolf‘ (1934), ‘The Bear’s Tale’ (1940) and ‘Swing Shift Cinderella’ (1945). It is hampered a little by large amounts of dialogue, but it still has plenty of silliness to laugh at.